My special love and deep appreciation go to the mother of our child, Chaya Leia Aronson, for her dedication to our child's life. No father could ask for or receive a more beautiful expression of love and caring than our son receives from his mother. 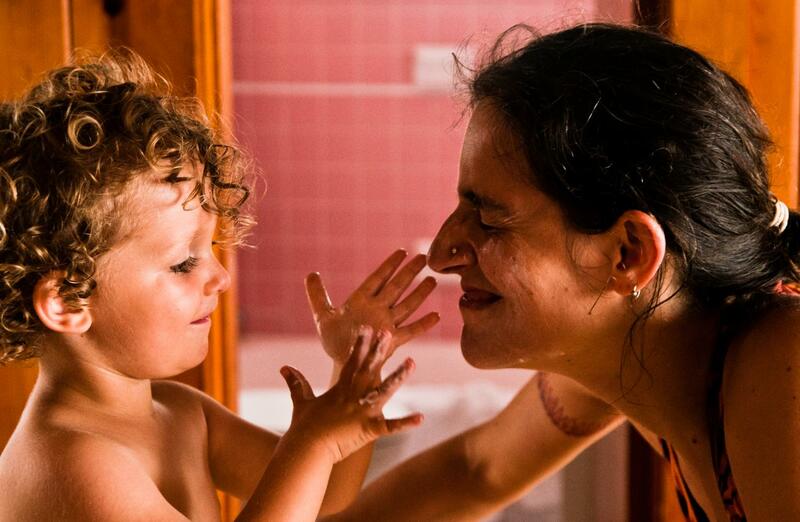 The care for our son began the very day his mother learned that she was pregnant -- in every way that she took care of her self, in the choices that she made and the ways that she in turn took care of the developing child inside her body. She grew a lovely, healthy baby, and this came with substantial physical and emotional stresses on her own body, and a life-threatening birth process, and our son's care has so often demanded of her the abandonment of her own wants and desires to enable her to meet our son's needs. She has done this as perfectly or imperfectly as any mother could, facing every challenge and demand and hurdle as it comes, with courage and compassion and sensitivity and consistency, and with all of her wonderfull, mysterious, passionate, commited heart. She is fierce, and tender, and authetic in her being, and her son and I are very blessed to have her in our lives. HOPE AFLOAT IN CONGO(<---click on title) is a video shot in the rural forest region of Equateur Province in the Democratic Republic of Congo, in a village that suffers under the thumb of paramilitary plantation slavery replete with all the horrors one could possibly imagine. Children in this village had never seen a balloon. In sharp contrast to the life of our son Birch, as portrayed by the BOY WONDER exhibit, the children shown in the video live with anxiety, hunger, malnutrition, treatable diseases, insecurity, fear, violence and other traumas that will last and inform their entire lives. Life in the Congocan be ugly, brutish and short, and it does not need to be. The injustice is totally unnecessary, and fixable, and the suffering revolves around the unconsciousness and inhumanity of an egregious social and racialexploitation maintained throughmilitarization, labor exploitation (slavery), natural resource capture and control, and crimes against humanity. 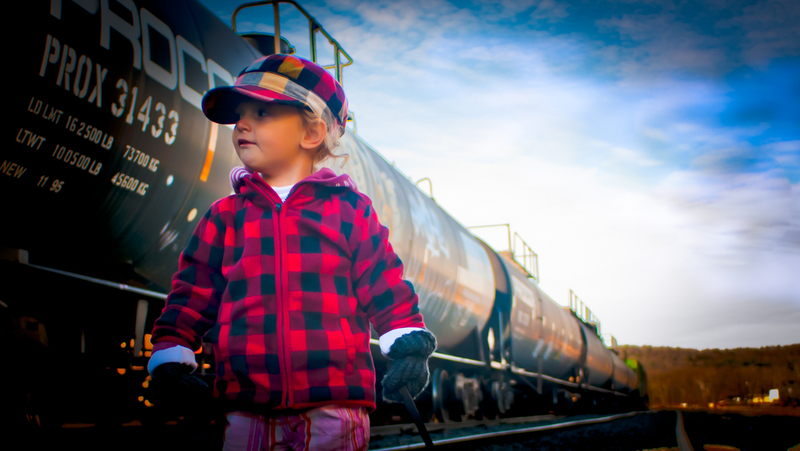 At 28 months old, our son Birch exudes confidence as he explores the rail bed and the long trains parked at the Boston & Maine Railroad freight yard in East Deerfield, Massachusetts. In his left hand he carries an iron spike he discovered on the rocky rail bed; to him this is a mysterious artifact and a treasure. Birch jumped from one wooden plank to the next, between the tracks, and he picked up spikes, and rocks, and threw them down on the iron rails, cackling with joy at every clank and bang and the echoes and reverberations of the cold steel. His favorite game was to walk the "balance beam" of the rails. These forms of play in the out-of-doors offer children rich experiences that enhance their senses, their awareness, motor skills, self-assurance and curiosity. This personal glimpse into the first 38 months of the life of our son offers a meditation on wonder, joy, curiosity and childhood, and the images testify to the privileges afforded to a white middle-class child born into post-modern materialist culture. One day old on 12 June 2013, our baby Birch Ivo Snow Aronson gazes up at his mother (who at the time was recovering from a life-threatening birth process). 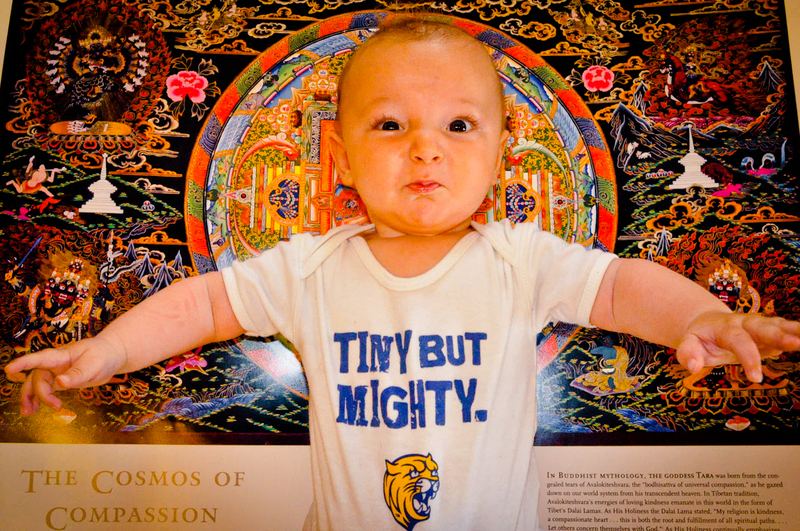 The consciousness and related psychological state of a human being begins in the womb and is informed by the birth process, what psychologist Stanislav Grof calls the "perinatal" dimension. A healthy womb and birth process can help to dictate joy, wonder, curiosity and possibility, while an unhealthy or toxic womb can lead to emotional and psychological distress in childhood and adulthood. Children who emerged from the womb through a cesarean birth process can be lacking in some of the normal healthy motivational aspects of being. The mother-child bond is a powerful force, and a mysterious one, and no child should be deprived the immediate nourishing and nurturing contact with their mother. 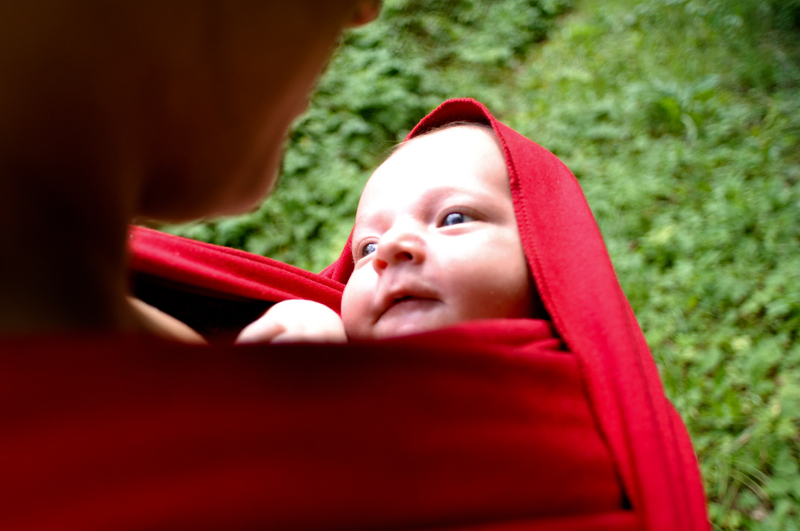 As the child grows his/her development will center on the formation of a healthy sense of self, unique and independent from the "oneness" of prenatal existence. 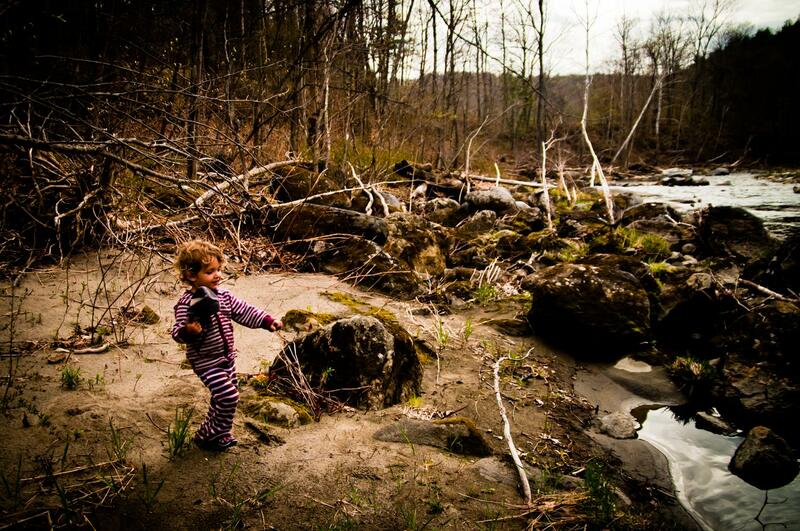 Birch is blessed to be born of a loving conscious wonder full mother, Chaya. 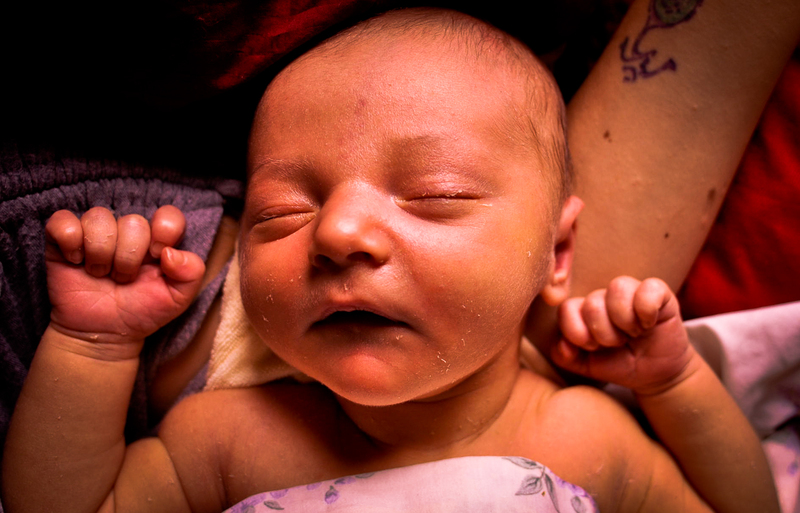 Five days old on 16 June 2013, Birch has begun to move his arms and legs, though most hours of each day are spent sleeping and nursing. Although we had prepared for and embarked upon a home birth, supported by two professional midwives, complications at the zero hour forced us to move to the hospital. We also chose to leave the hospital very soon after the birth, and allow his mother's recovery at home, under the watch and care of our midwives. The vernix caseosa can still be seen peeling and flaking off the (normal) skin. At less than one month old, Birch finds his deepest bonding with his mother, and his health, growth and development are dictated exclusively by his mother's diet and his ability to nurse. Given the birth trauma (blood loss) suffered by his mother, it was necessary over the first week to pump her body with strong herbal infusions. Mama also drank herbal infusions to stimulate and increase milk production. Mama's recovery was rapid and successful, her condition stabilized, and Birch gained weight normally. Wonder. Adoration. Curiosity. Love. Trust. Over the first two months our son begins to individuate further, developing motor skills and focusing his attention more. Soon he begins to wave his arms and legs more, and he starts to roll slightly one way or the other, but he cannot yet turn over or lift his head. People and things catch his gaze, and most of the time he bubbles with what we define as "joy", "curiosity" and "wonder". His awareness is expanding daily, sometimes unnoticeably and other times visibly. Birch played this day in the dirt of the raised garden beds and he even tasted the dirt a few times as a baby (like him) will do. 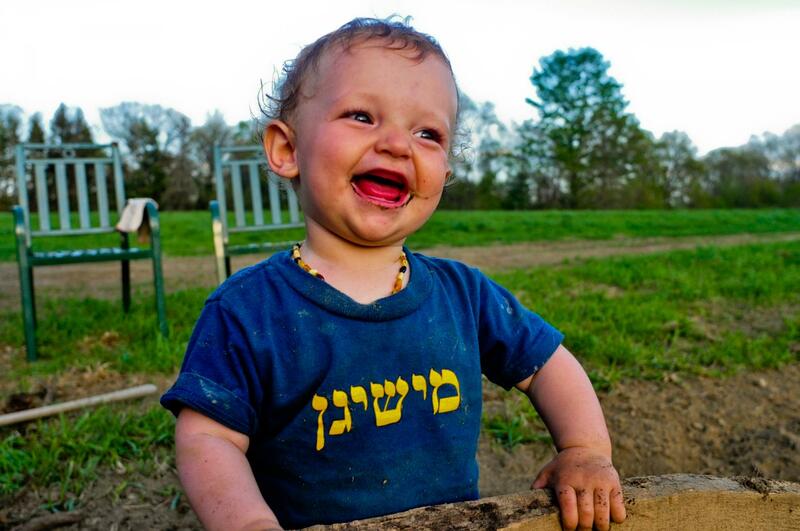 His tee shirt is adorned with the Yiddish word "Mashugana" -- which translates to silliness or craziness -- and it was the first spring day where it was warm enough to be in a tee. 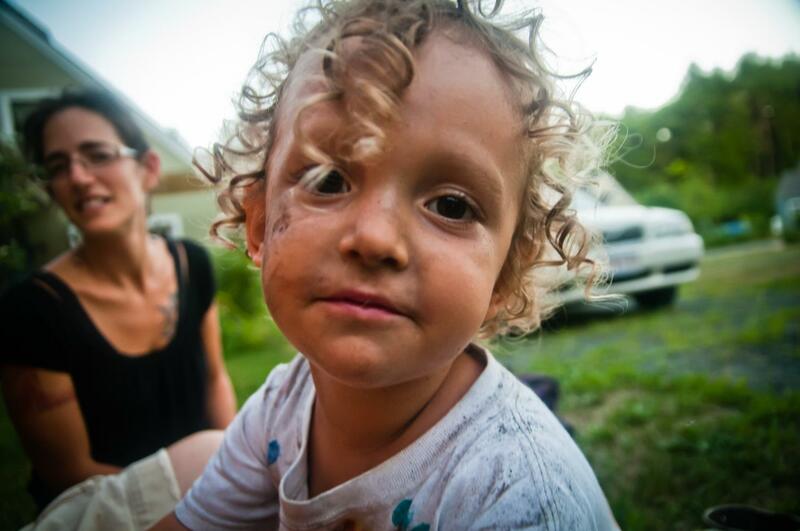 He plowed through the dirt with a toy truck; shoveled and spaded; crawled and rolled and sat in it expressing what seemed like limitless joy, and his joy (as always) spread to infuse us heart and soul. 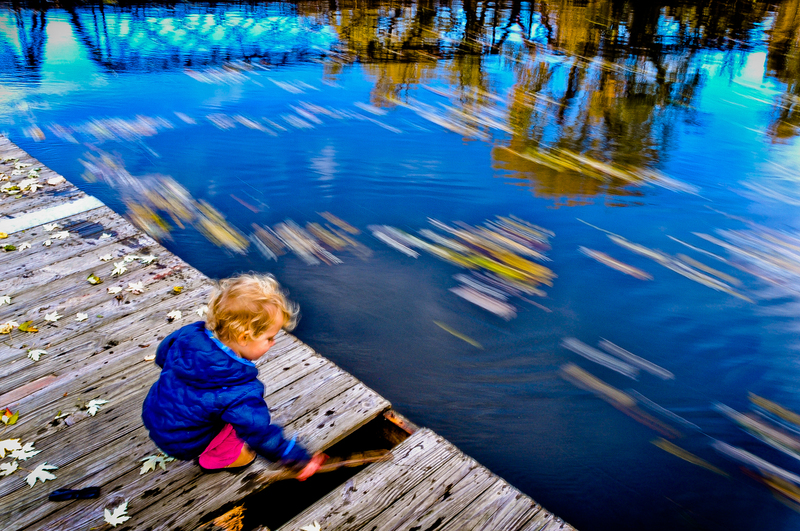 Many children never have much chance to play in the great outdoors, and we believe this to be a source of pathological behaviors inappropriately treated with medication instead of time in nature. 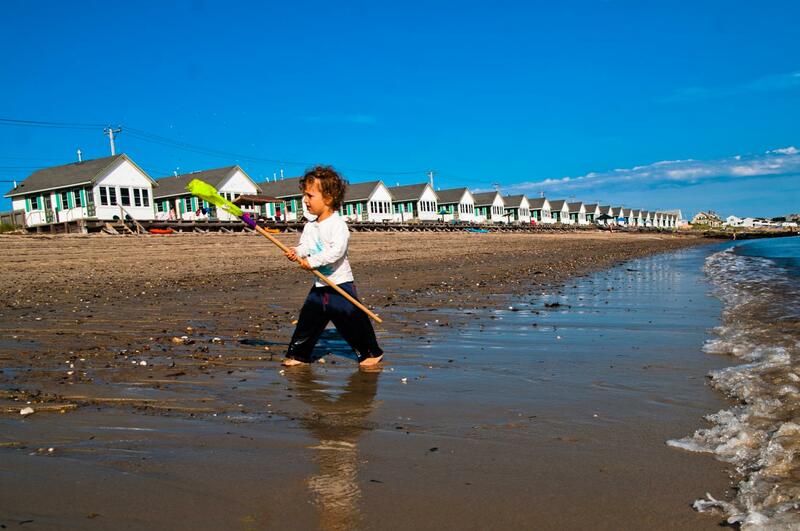 By the end of his second summer of life Birch is standing and walking, though toppling often. 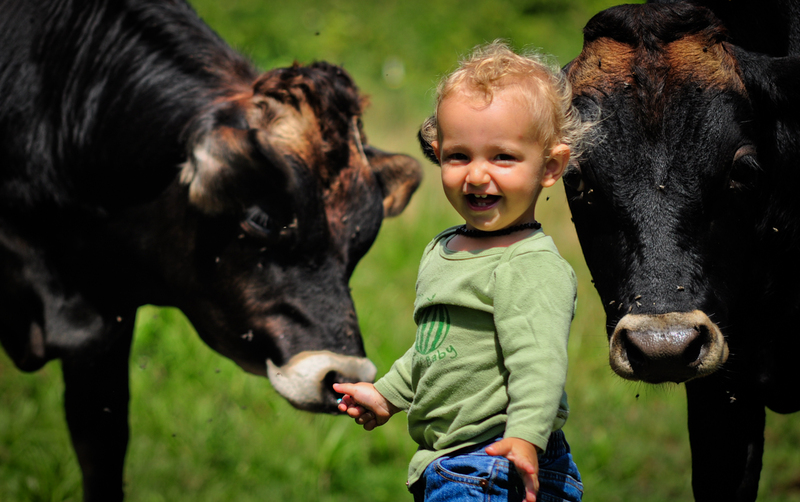 He loves the sounds, sights and smells of the farm, which is another form of being in nature. He is delighted by the (free range) chickens, and the (grass fed) bulls, and we begin to educate Birch about where his food comes from. He loves the sounds that the animals make, and the funny way that daddy imitates them: he listens intently to everything in his world, and his abilities to discern, interpret and communicate are enhanced by environments that are peaceful, dynamic, safe, healthy, authentic and natural. Sun bathing in July 2015 at the local waterfall behind the Brassworks factory, Birch appears deep in thought, his fire boat beached along with him. Birch is very shy of the water and will often stay on shore without venturing too far into the wet. He loves to splash and romp in the shallows, and in the bathtub, where (both places) he invents all kinds of games to play with all kinds of "toys" -- balls, pots, cups, funnels, his red boat, things that should never be gotten wet... Birch also loves to be naked. A healthy conscientious childhood demands a healthy sexuality, a healthy (shame free) body image, and the maintenance of both healthy and appropriate boundaries with caregivers and other adults and role models in a child's life. 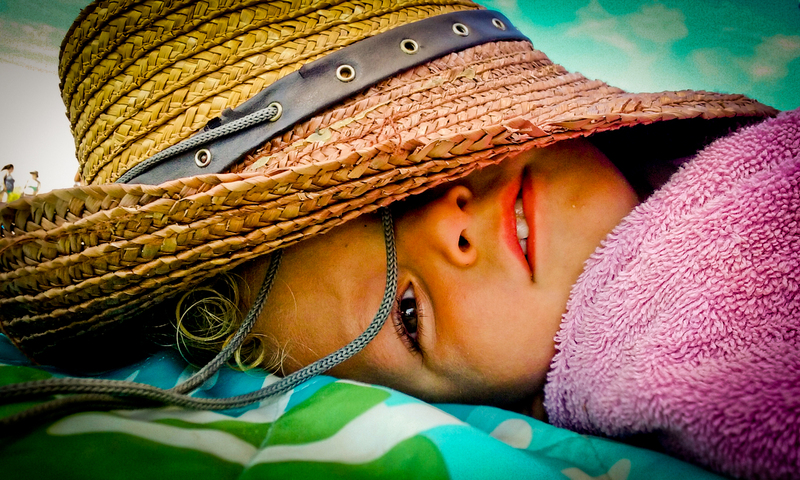 Birch lies down on the blanket after a cold dip in the Atlantic Ocean at Salisbury Beach, New Hampshire, finally submitting to daddy's requests to take a nap. His penetrating gaze bespeaks his playful nature, and sense of humor, and what I often interpret as wonder. He hides under the hat, during which time he demands us to play his version of hide and seek. He wants us to ask "Where is Birch? I can't find him anywhere? Have you seen Birch?" to which he pops out from under the hat, all giggles and surprise, and then says, "again," and he hides again, demanding us to find him, all goggles and surprise. 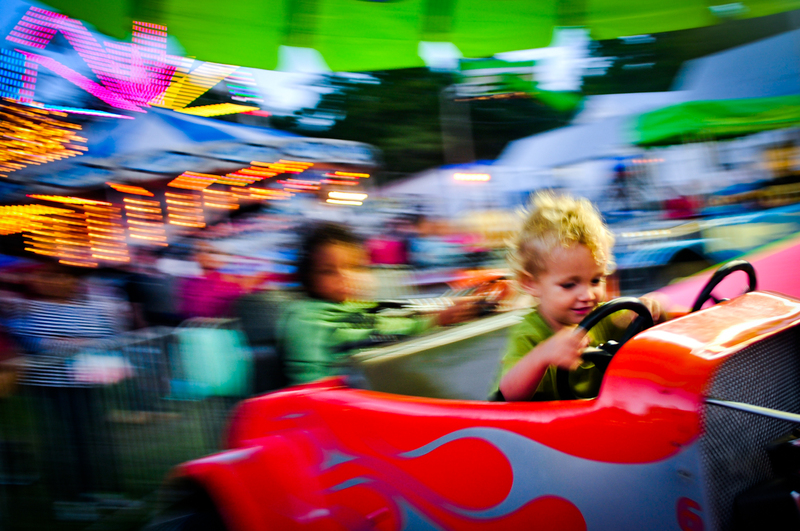 The Cummington Fair (Cummington, Massachusetts) offered Birch his first experiences exploring a carnival. 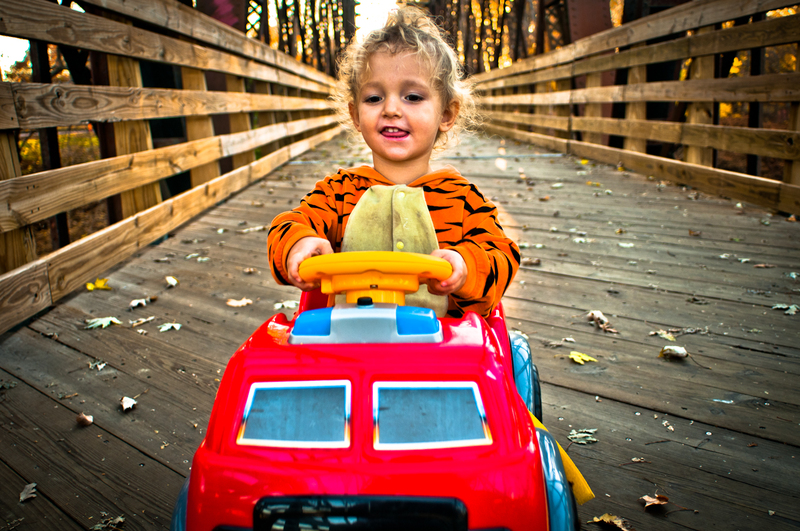 Imagination plays out in Birch's interaction with the little cars, where he mimics the behavior of mommy and daddy and other people he has seen engaged in our westernized car culture, while going around and around on a small circular track. Color, sounds, smells, animals, tractors, the variety of people -- all stimulate Birch's adventurous spirit. 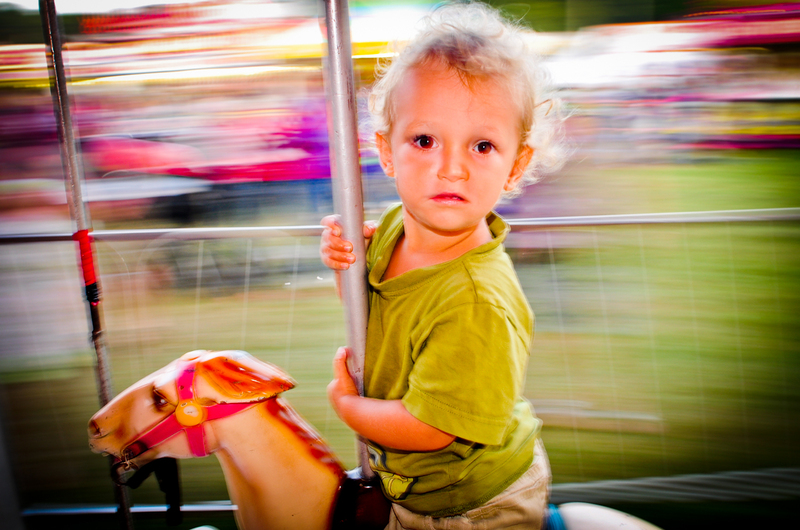 At the fair in August 2015, Birch was excited by the Merry-Go-Round, and when he chose his horse -- he likes to choose in all things, and he is frustrated if we deny him his agency -- he chose a small one, and he expected that it would go up and down like the other, bigger horses, and it didn't move up and down (but remained fixed). Birch was at first puzzled, and then upset to find that HIS horse was not going up and down too. The look on his face here captures that moment between the mystery and the confusion, on the cusp of tears and disappointment. Birch explores the hole from a missing plank on the skull docks of the Connecticut River near Northampton, Massachusetts. The great river is all mystery and adventure; Birch throws things in it, picks them out, watches leaves and sticks and waterfowl float by, and he scours the deep dark shadowy river for fish. Curiosity, play, experimentation are all fundamental to a healthy expansive imagination -- and imagination is fundamental to creativity and problem-solving. Airplanes caught Birch's attention and wonder for a very early age, and so it was logical that we should visit the local airport in Northampton Massachusetts. Birch was thrilled to spend several hours spotting planes, watching them land and take off, and seeing where they park, who drives them, and where they sleep for the night. 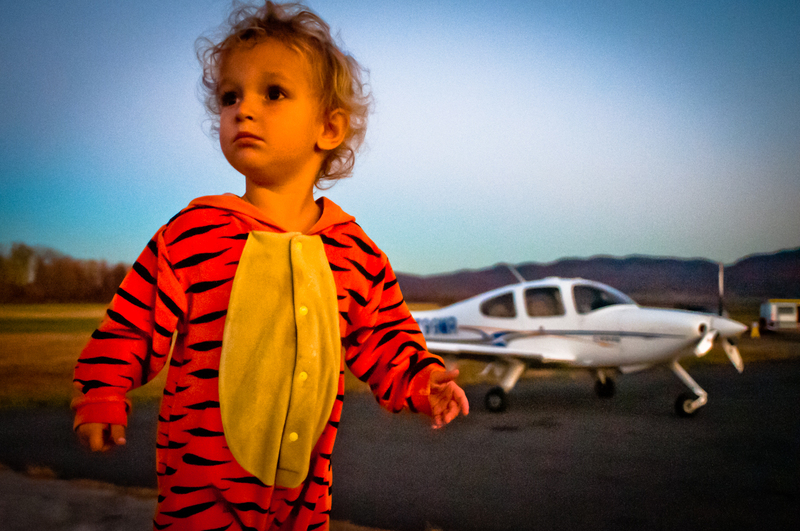 Here he watches intently, verbally expressing his interest at every turn, as a small Piper Cub approaches the runway for a landing. To nurture a healthy socialization in Birch we often engaged with regular playmates that Birch has come to know and love. 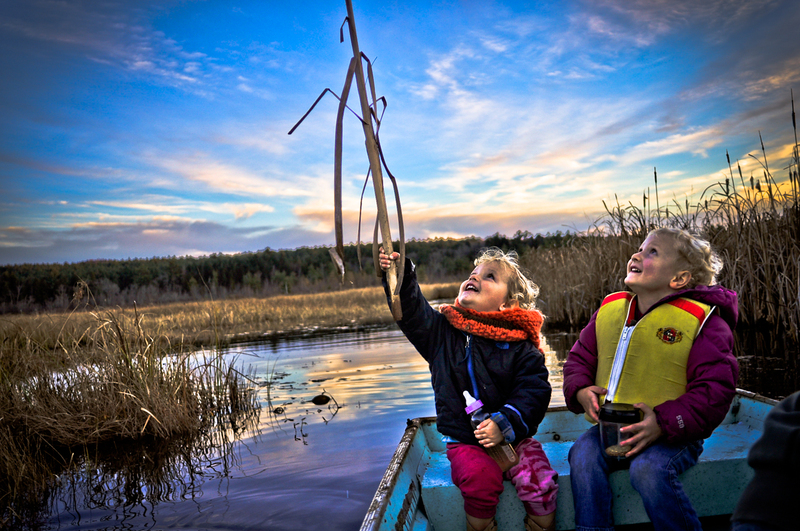 Here Birch and his friend Sunna play with a cattail thrust into the sky from a small rowboat on a beaver marsh in the fall of 2015. Birch learns friendship, sharing, communication and other "skills" from the healthy (and sometimes difficult) interactions with appropriate playmates. Birch's fire engine is propelled forward every time Birch presses a little yellow button on the steering wheel. Here he is driving across the former train trestle on the Connecticut River bike path in Northampton Massachusetts. Such adventures nurture Birch's self-assurance, and they teach him about speed, momentum, and movement. Most critically, it is an opportunity for our child to have fun and to play, something that far too many children are deprived of. Imagination, healthy play mean the difference between creativity and reactivity, between self-exploration and self-retraction. Birch explores farther and father from his primary source of security -- his mother -- but always comes back to her. 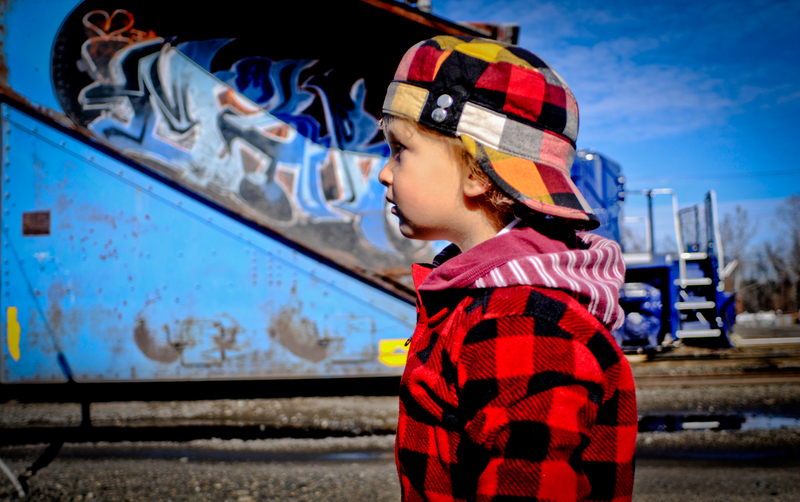 Trainspotting at the Boston & Maine Railroad freight yard in East Deerfield, Massachusetts, (November 2015) Birch is captivated by someone or something down the tracks, while behind him a big diesel engine passes behind a giant snow-plow machine painted with graffiti. We offer Birch the capacity to experience freedom -- protecting and guiding him, but not excessive in directing or controlling him -- to explore, experience and engage with the world according to his limitations, but not proscribed by them. 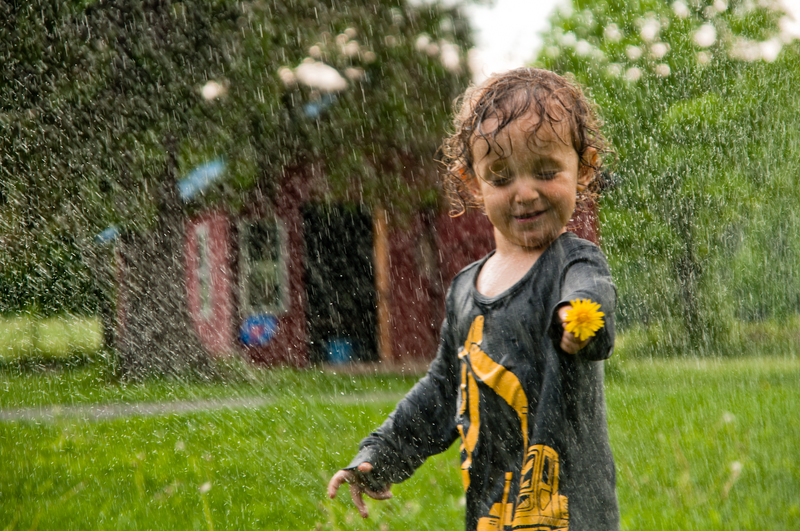 A warm summer day at home on Egesta Farm leads to this portrait of our son offering a dandelion in the spray of the garden hose. 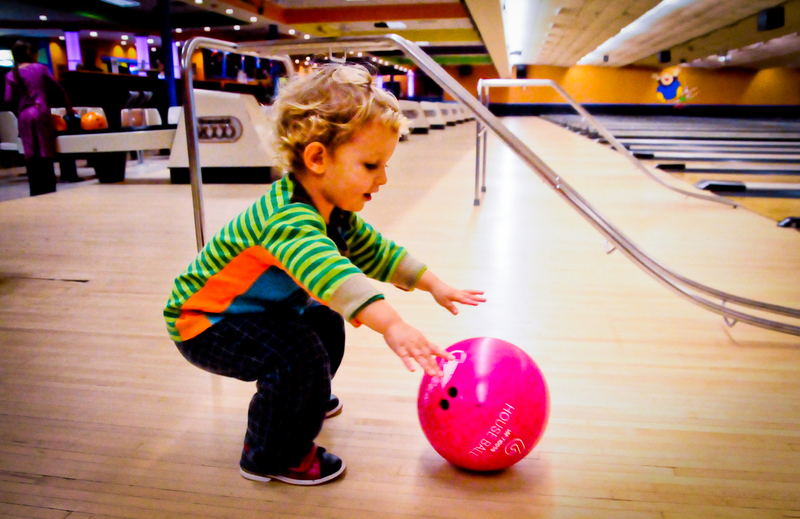 The bowling ball is too heavy, but Birch pushes it as best he can and then giggles and laughs and shouts as it rolls ever so slowly to the end of the lane and topples a few pins. Sometimes he prefers to roll it, other times he uses the stainless toddler's ramp (at back). The slippery floor, the odd shoes, the crash of strikes and spares and the clinks and clangs and groans of the pin resetting machines all capture Birch's attention and would rivet him to the lanes for hours. December 2015: Birch loves the local "Dance Spirit" contact improvisation and alternative dance held every Sunday morning. At the beginning, if we go early (or if mommy takes him), Birch runs around the big open space playing hide and seek in plain sight, jumping and rolling with daddy (or mommy), prancing about the floor, chasing and being chased, most often directing us how he wants to play and be played with. His communication skills are advanced for his age, and he often declares and shares his feelings (not always easy for any of us). As the dance fills up he becomes more and more shy, and -- overwhelmed at last by too many dancers and too loud music -- he retreats into the security of daddy (or mommy) and sometimes complains that the music is "too loud mine ears". 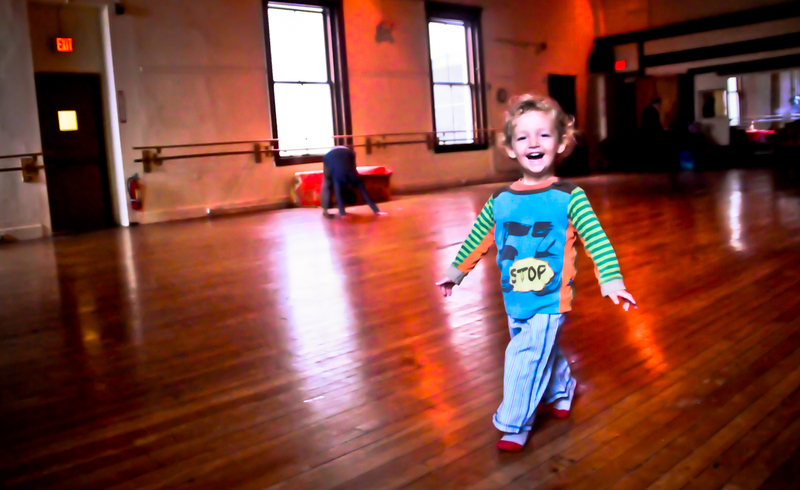 The dance space offers him an expansive play time, and he witnesses people interacting in a safe healthy dynamic physicality, expressing their selves through touch, laughter, movement, stillness, song, eye contact. 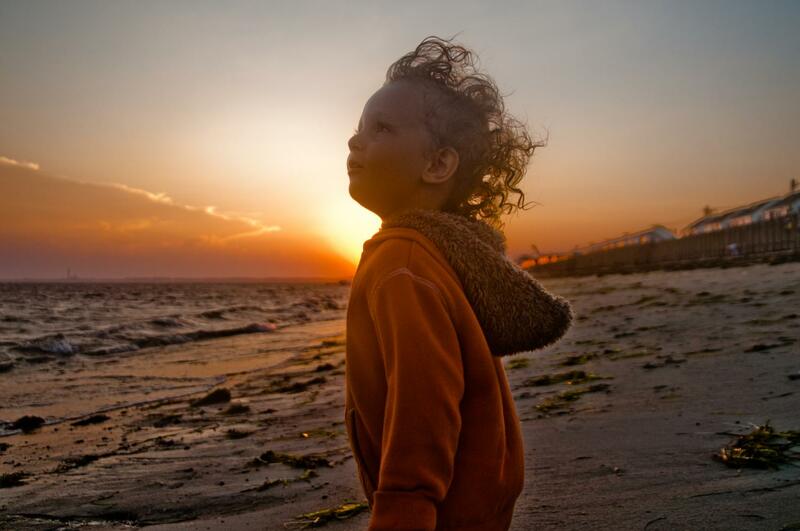 Such experiences nurture Birch's physical development and they stimulates and support his emotional intelligence and his deepening sense of trust. 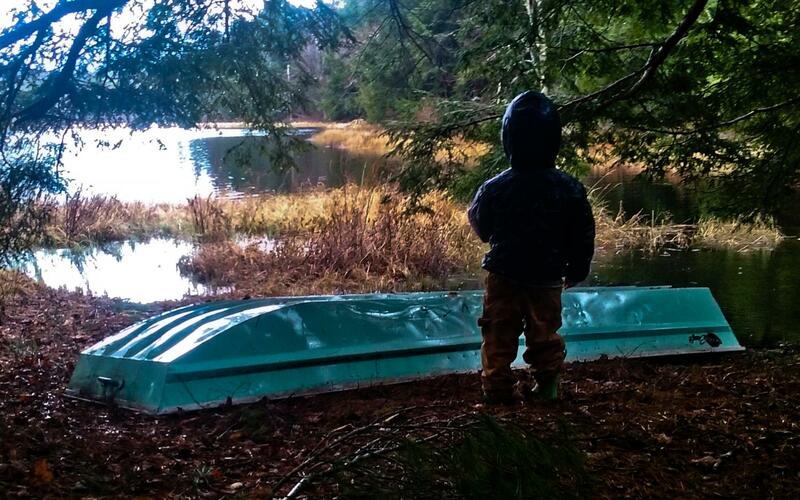 Our friends' rowboat sits on the shore of the marsh near their home in Goshen Mass, and Birch stood there a long time on an early spring day and in a moderate rain contemplating the pond and the rain and the ripples of a startled beaver. He has gone through phases, and it seems that everything is cyclic: at times he loves the boating, at times he refuses it. But as he grows and individuates so too does his sense of adventure and willingness to take risks. Spring has not yet sprung but Birch's love for the water of any and all varieties has begun to flourish. This place, a small property in Colrain Mass, he calls "mine river" and we go there often in early spring and hunt out the deer and fox and occasional otter tracks on the shore; the kingfishers that scream over the stream and dive straight into it for trout; and the vernal pools on shore under the trees. The landscape remains a bit too much for his little body, and so I end up carrying him often after he suddenly decides to stop walking and proclaims with w whimper: "Uppy daddy.... Uppa..."
Tidal pools and little scurry crabs and slimy seaweeds and everything else under the sun provoked to the surface of his being the exuberance and curiosity and sometimes fear that lives in Birch. here he examines the cavities and crevasses that crabs disappear into as he moves closer to them. He is afraid of crabs in the water, of slimy things but not seaweed, which he asks us to identify, and when we do he tastes it (becuase we often serve him seaweed snacks). 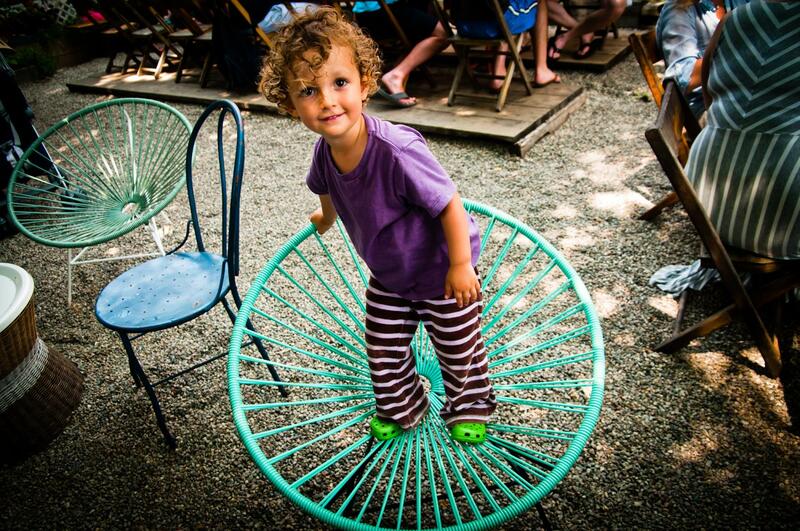 Balancing on these unstable wire chairs was a whole new adventure that lasted way beyond the arrival of his favored sweet potato fries. 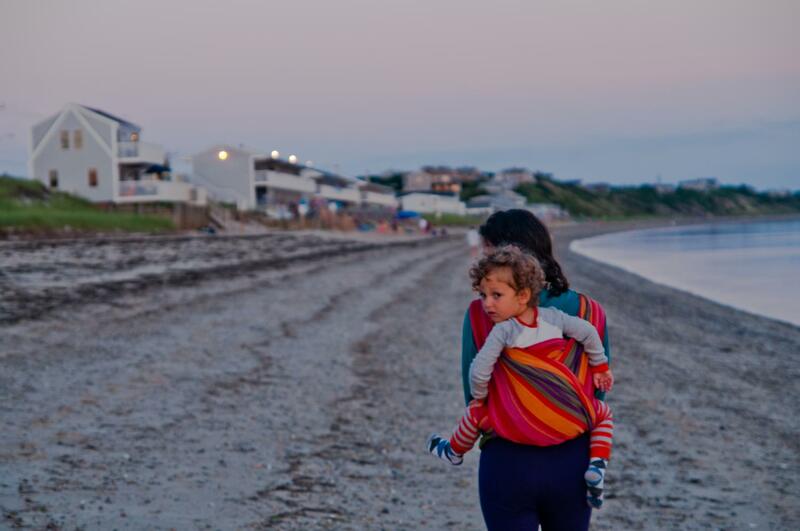 At sunset on a North Truro beach Birch loves to ride in mamma's carry sling. He has played all day, and taken no nap, and he is sometimes mellow and sometimes wild in exhaustion. 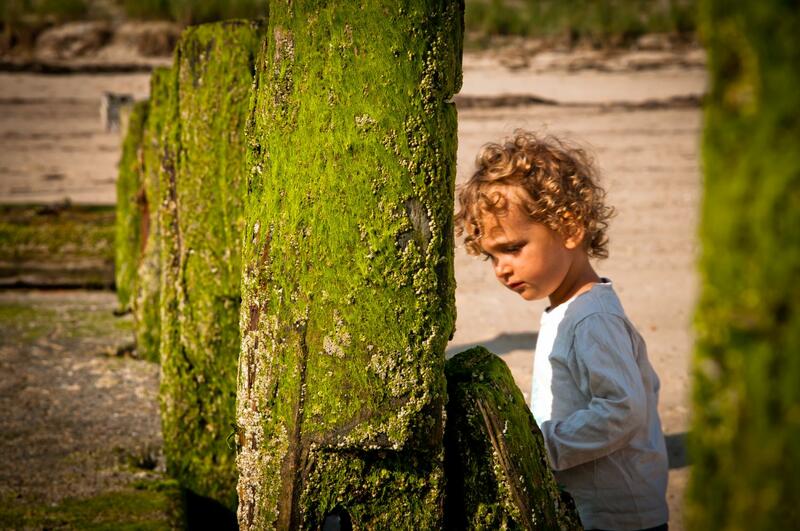 he is ever seeking to understand the adults and sights and everything around him. Birch could not understand why "mine net" did not catch any fish simply upon immersing it in teh water. It was a great disappointment. Birch spreads sun screen on mamma's face and delights in the texture of it and the softness of mamma's face and her ever present playfulness. 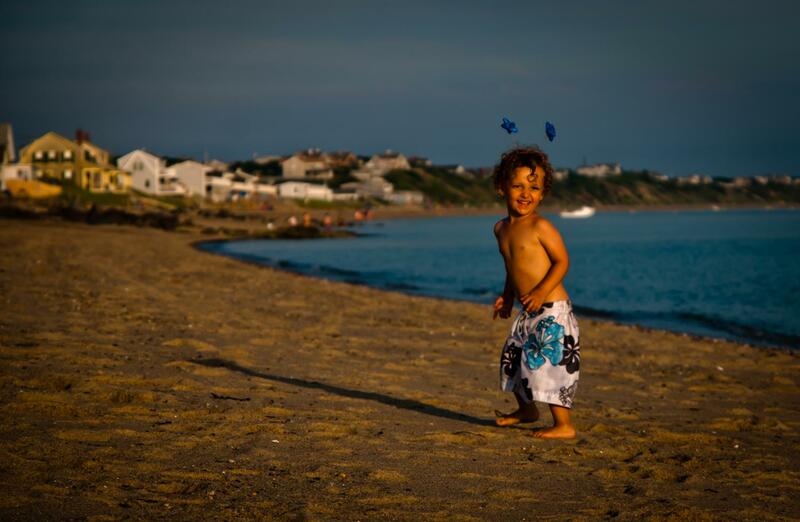 Unbounded unbridled wild joy at sunset on a North Truro Mass beach. Birch this day ran wild at sunset while waves bashed the shore under an onshore blowing gale clocked at 38 miles an hour. It was one of the most delightful days of our life -- witnessing our son in that wild space of childness engaging with such a wild space of nature.